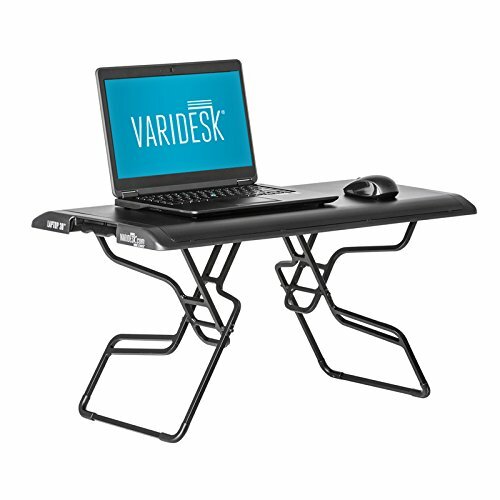 Designed for laptops, the lightweight, sturdy, portable polycarbonate Varidesk small standing desk is easy to pop up, fold down and transport. Large enough for any kind of laptop. Completely assembled upon delivery, the Standing Desk folds up in two seconds. Light weight and has a handle, meaning it can be easily carried on business trips or to a meeting and serve as presentation desk. It’s discreet and elegant when is folded. Portable in order to accommodate the “on the go” lifestyle of busy executives. Bring the office anywhere by using the Standing Desk!